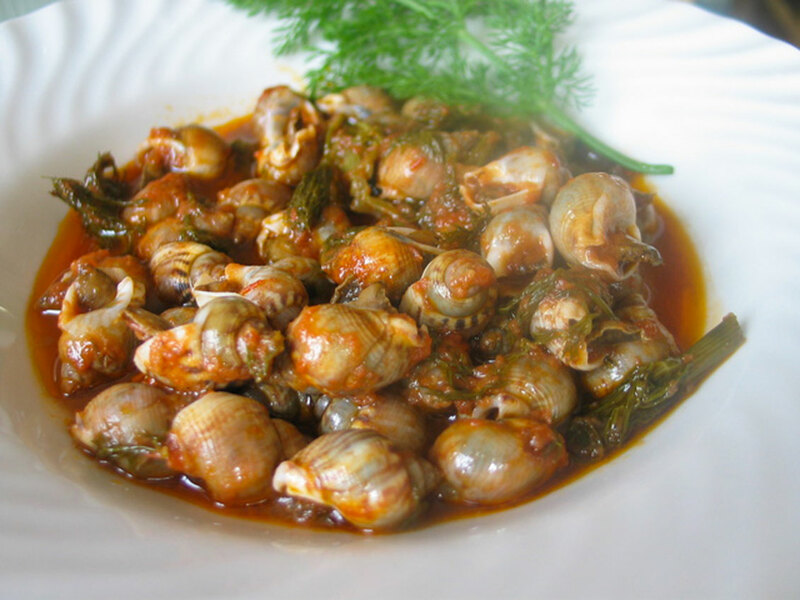 Those that in other parts are called sea snails, for us they are the famous “bombetti in porchetta“. Bombetti in porchetta are a delicious dish, loved and passed down over the years by fishermen and loving grandmothers. While you eat bombetti in porchetta you will be involved with body and mind, in fact, taking them out of the shell requires some talent, with a toothpick or even no … maybe not the ideal dish for a first date. Wash bombetti and then leave them for at least an hour exposed to light, in a pot with cold water and salt to cover them completely. Then, after having rinsed again, place them directly with cold water on the stove and let them boil for ten minutes. Leave aside the water boiling in a pot and prepare the sauce with onion, garlic and chopped fennel. Combine bombetti, salt and pepper and add the wine. When the wine has evaporated, add the tomatoes, stirring over high heat until the smells and flavors are blended. Now add the cooking hot water to cover the bombetti. Close with a lid and cook over medium heat for half an hour, until the sauce will be enough consistent.